From the comfort of my purpose built mobile beauty salon 'Beauty On Wheels' provides beauty therapy and beauty treatments for ladies in Bolton and the surrounding areas. Hello, I'm Jackie and thank you for visiting my website. Beauty On Wheels offers a full mobile beauty service - but with a difference - I bring the beauty salon to you! I can visit your home, workplace or venue anywhere in the local Bolton area. I am a qualified beauty therapist offering an ever increasing range of beauty treatments. My mobile beauty therapy service offers a complete range of pampering treatments including sugaring (waxing), facials, body massage, manicures, pedicures, eyelash extensions, eyelash tinting, semi-permanent eyebrow extensions, gel nails, HD brows, LVL lashes, Hopi ear candle wax and fake bake tanning creams - all in the comfort of my luxurious purpose built mobile beauty salon. 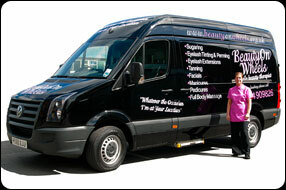 Beauty On Wheels provide the ultimate in luxury beauty treatments and deliver a first class service. "Whatever your Occasion, I'm at your Location"
Because I come to you, special events / pamper parties can be catered for at the location of your choice - be it your home, workplace or venue. No expense has been spared to bring you this warm, welcoming and private experience. The convenience of the beauty service I offer will soon win you over to trying someone new. You can relax and receive my 100% attention away from all the pressures of your daily routine. You can view images of my mobile beauty salon in the Gallery. Copyright © Beauty On Wheels (Bolton). Info. Web Design and SEO Services by WebsitesNorthWest.